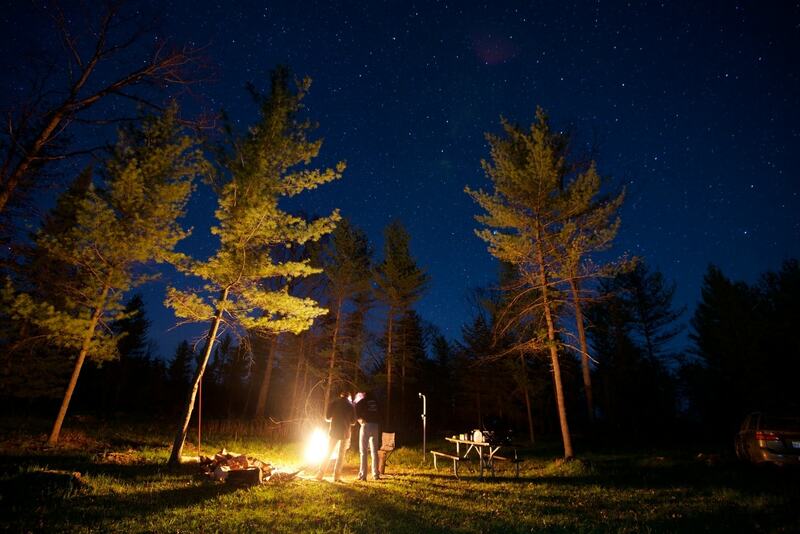 There are few better ways to immerse in the great northern woods than spending a night in it. Go to bed by the light of flickering stars instead of the backlit screen of a mobile device. Wake to the sounds of the forest coming alive all around, versus the monotonous tune of an alarm. Camping brings us back to simpler times and removes distractions of the modern world. Northern Michigan has vast public lands and state campgrounds with excellent facilities, making it easy to get into the woods. There are also trails where you can set up camp just about anywhere you’d like. The Manistee River Trail near Mesick offers incredible views and camping opportunities. The trail is part of the Manistee National Forest and meanders 11 miles along the river and on top of bluffs overlooking the valley. If you are interested in a longer backpacking and camping trip, a bridge connects the Manistee River Trail to the North Country Trail. This creates a 23-mile loop through natural, wild, undeveloped Michigan forest. Many of us grew up camping and hiking with friends and family, but maybe it has been a few years since your last trip. The Manistee River Trail is a place where I have spent many nights. As a kid, I would camp it in the summer with family and friends, when the nights are warmest and bugs are at their worst. However, the past two years I have been camping more and more in the spring. The nights are colder, there are no bugs to speak of, and there aren’t many people. The temperatures are perfect for hiking during the day, and the cool nights will give you the best sleep you have ever had in the woods. Evening fires are unbeatable as everyone gathers around them to warm up and trade stories. A hot cup of morning coffee becomes a welcoming comfortas you drink it snuggled in your sleeping bag. You will need to bring an extra layer of clothes, but the camping traditions you grew up with will be much more enjoyable with the comfortable temps and lack of bugs found in April. Camping in hammocks can give your back a break and make it easier to fall asleep comfortably in the woods. No sticks, rocks, or uneven ground to worry about as you lie under the stars. Eagles Nest Outfitters is an outdoor company that specializes in lightweight, packable hammocks. My personal favorite is the Double Nest model. They are easy to set up and finding good trees to tie off to is rarely a problem in Northern Michigan. ENO sells under-quilts that attach under the hammock to keep out the cold to 30 degrees. They also sell rain flies and bug nets.